When we learned that we were pregnant this time, I knew that I would be designing not just one but two rooms in our home. Why, yes, we do need a nursery fit to bring home a sweet baby boy but since Madeline would be getting evicted from her crib, I knew I wanted to transform her room into the perfect space for our big girl who is becoming a big sister so soon! If you’ve been reading here a while you know that we still lived in our first home when she was born but that while I was pregnant our contract fell through on what we thought was our dream home. 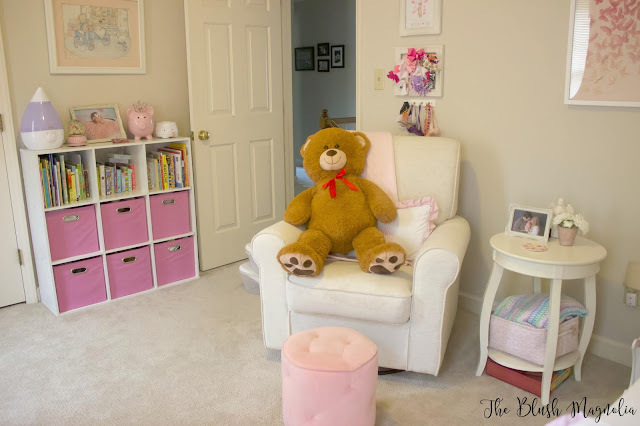 So, I moved along with designing her nursery around the space we had and it did turn into such a beautiful, serene room but there were things I never got to do because I knew that we wouldn’t be in that home for much longer. For example, I really wanted a beautiful accent wall. I dreamed of soft floral wallpaper. I thought of a feminine chandelier casting the prettiest glow onto her walls at bed time. But those types of projects just didn’t make sense in terms of resale value for our home so I didn’t end up bringing any of those dreams to fruition when designing her nursery. All of her furniture fit beautifully in her tiny space in our first home though and I was so pleased with how her nursery came out after all. Then, we bought our current house, which I love. The second we found it it all of a sudden made sense why our deal on the previous house didn’t work out because this is without a doubt where we are meant to be. Yet when we moved in Madeline’s room just never seemed quite “right.” It’s one of those things that would only bother a mama because I know no one else would’ve ever thought it and I often got compliments on her nursery. It just didn’t seem perfect to me. I could always tell that the furniture and decor had been purchased for another space and then just made to work here. We closed on our home the week I went back to work from maternity leave and then moved with a four month old baby. It was an overwhelming time in our lives so I just did my best with making her room “work” and we all got used to it the way it was. In fact, I know it’s the only room she ever really remembers so I’m sure she thinks it is just perfect how it is. 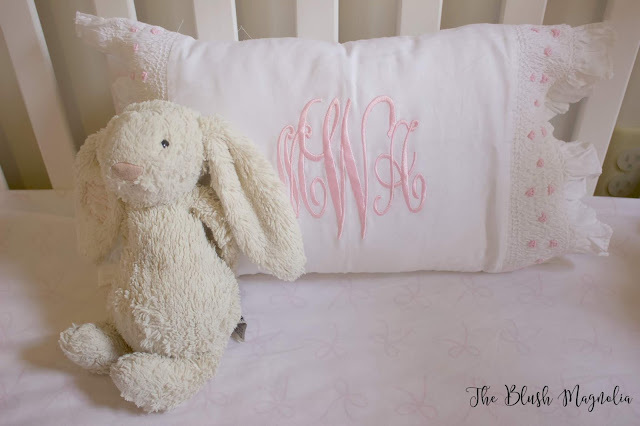 Yet when I learned we’d be doing some shuffling around to prepare for the new baby, I realized that this was my chance to give her the gorgeous room I’d always dreamed of for her. This is our starting point and there are so many things in this room that I do love and will be keeping like the bow curtains, dresser, lamp, and wall shelves. 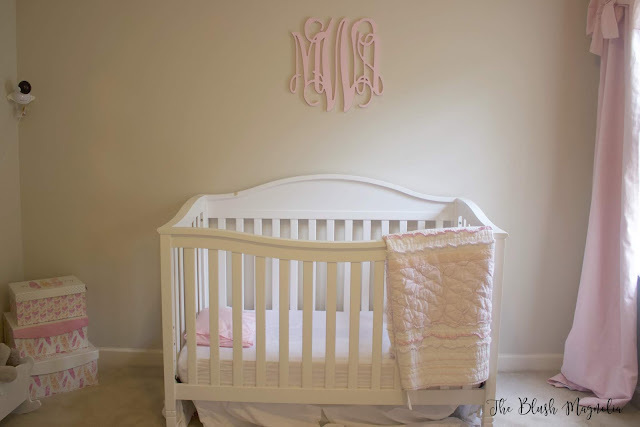 These were some of my favorite purchases for her nursery and pieces that I feel will grow with her over time. I've tried my best to get rid of the glider but Madeline all of a sudden just loves being rocked at bedtime so I am predicting it will stay for the time being as well. This is my inspiration for her new “big girl” room. I’ve showed her my favorite ideas to get her approval and now I am so excited to see the space come to life over the next few weeks. 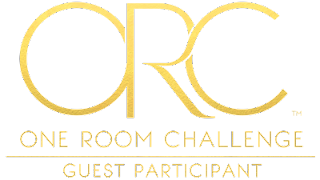 I will be designing this room as part of the One Room Challenge, which takes place over six weeks. That worked out perfectly because I am now in my third trimester so I need this project complete! 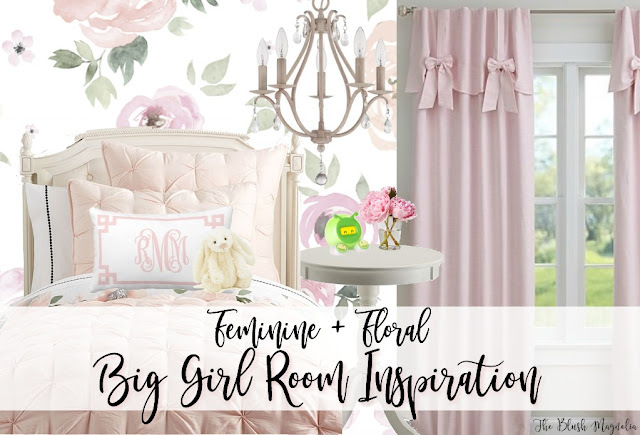 I’m excited to share this project with you all and hope you will follow along over the coming weeks as her room transforms from nursery to feminine and floral "big girl" space. You can also check out the other One Room Challenge participants' room transformations from all around the country here. Love this! I know I should do more for E's big girl room, but all we did was get her a new bed. Since we may move this spring I did not want to do much, and I have the same bedding from her crib in twin size. If we do move then I will perhaps let her pick out more. This is so exciting! I love the one room challenges. I think it looks great, but I get what you mean about purchasing furniture for another space and making it work in a different one. 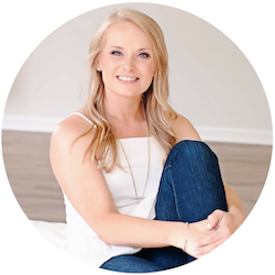 I can't wait to see what you do! the floral wallpaper is SO pretty! I can't wait to follow along. So fun that we are both doing girls' rooms!! Coming in from ORC. I am looking forward to seeing this room come together....I totally dig that bed!!! LOVE this design! Can't wait to see it unfold! Aww this is absolutely darling! You have created such a calm, peaceful, beautiful nursery! And I can't wait to see the transition over the years.